The Medium Salmon Egg Clusters come with 12 egg clusters per pack. This is an Artificial Roe bait that is LOADED with REAL Shrimp & Roe scent and other natural ingredients that we have kept a secret (we can't give away all of our tricks). Not only do we package these baits with scent, they are also infused with scent during the manufacturing process. This double scenting truly sets our baits apart from the competition and gives our customers a serious advantage. When you need to bump up the size of your bait but don’t want to mess with gooey egg hands the medium clusters are perfect. They are about the size of a penny and are the ideal size for steelhead. They come in a bunch of colors for any situation you may encounter. I personally love the hot red color for both salmon and steelhead. Primarily I drift fish these but they can also be fished under a float or used with jigs. These also have a great scent impregnated into them. Not to mention durable. Who doesn’t want to fish with a bait that will stay on cast after cast? Especially when egg supplies are running low, these clusters are great to help stock back up without using any of your supply. Winter of 2017 I ran out of eggs, so I picked up some X-Factor eggs from Sportsmans. Since then I have caught a lot of steelhead and salmon on Red, Peach, Shrimp Pink, and Peach/Shrimp PInk mix. I've also used every size and caught steelhead with them. I string them on with a needle as shown in one of the informational videos. 100% of my fish so far have come from drift fishing them. Great product and great service. I just wish more stores carried them in my area because Sportsmans has dropped the ball. If you fish for steelhead you need these in your vest. Work just as good as real eggs, I think better without the hassle of real eggs. Great Product !!! I bought these to use on catch and release, artificial only trout rivers. They worked very well drifting under a float. I have a few different colors and will be buying more. Great product and great company. I really like these baits. I've gone out 4 times so far with them and have had action every day with landing at least one steelhead. I rig them how they recommend with a bead above the hook(I use size #4). I like to add a little yarn when threading the cluster to the leader to give it a little something extra, but either way this bait works well! Bought this for my wife since she does not enjoy real roe and bait loops, and the fact that a lot of places are not allowing real bait. Very good quality, looks more real then other items I have looked at, and very tough. Holds on to the hook with the strongest of casts. Only problem is that we have to order them here in Idaho has I have not been able to find them anywhere. Q: What size egg cluster should I use for sizes 6, 8 and or 10 hooks? A: Thanks for the question, and for your interest in our products! 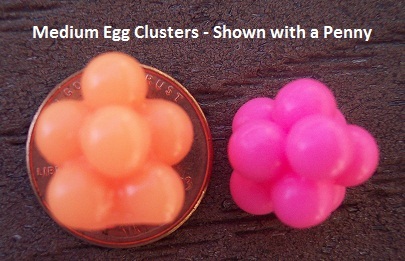 The best size eggs for #6, 8 and 10 hooks would be our Mini Egg Clusters and our Single Eggs. I personally use both of those baits with #6 and #8 hooks when I fish for Trout. Let us know if you have any other questions. Q: Interested in using medium egg clusters for steelhead fishing in rivers feeding Lake Erie in Ohio. Any suggestions for color/scent? Thank you for your interest in our baits! We ship a lot of medium and mini eggs out your way. 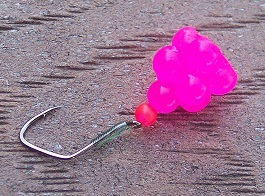 Top colors are Steelhead Orange and Shrimp Pink but Peach, Hot Red and Hot Pink are great colors as well. Our most popular scent is shrimp and roe, even where there are no shrimp...steelhead just see it as food and they can't resist it. Let us know if you have any other questions. Q: does it matter how egg clusters are threaded on the line when bobber doggin. flat side towards hook or egg side toward hook? A: Great question! For a natural presentation, rig your egg clusters flat side down (that is flat side toward the hook). The reason for this is that a properly fished bobber doggin setup uses the float to literally drag the bait down river. When this happens the water, for lack of a better phrase, "rolls off" the bait or allows the bait to glide freely down river because of the cluster configuration. There's an element of physics in play here; similar to how a golf ball has dimples in it, allowing it to fly through the air, rather than wobble, the clusters configuration allows water to act in similar fashion. I don't recall rigging them the other way for bobber doggin but there is a chance the bait would wobble slightly, which may actually trigger a strike in some situations. This is what is happening when larger beads (soft or hard) are bobber dogged...they wobble, and sometimes the fish go crazy and bite, othertimes they won't touch it. I hope this info is helpful. 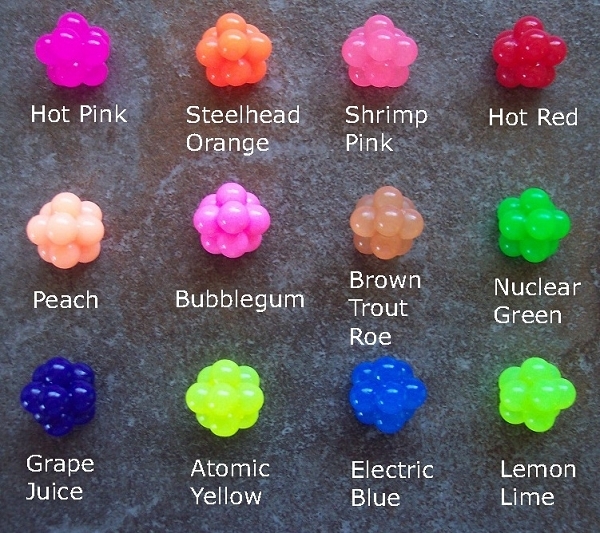 Q: Are they real fish eggs? Q: ARE THE SALMON EGG GOOD FOR STELHAD AND SALMON? These are great for Salmon, Steelhead and Trout. Feel free to give us a call, email or just post here if you need help picking size and color for your area.